Can a tough season help Chiriches toughen up? 1 and a half seasons with International Curtea de Arges, 1 and a half seasons with Pandurii Targu Jiu, 1 and a half seasons with Steaua – even statistically, it looked like this summer was the right time to move for Vlad Chiriches. Without a doubt the best and most exciting defender from Liga 1 and one of the very few Romanian players gifted with enough quality to make it big in the near future, the 23 years old is “on the verge” of a transfer abroad for more than six months now. Not sure if he knows it, but this is the biggest (mental) challenge of his still young career. Linked with several important names, including AC Milan, Chiriches started another season with the Romanian champions. Not a bad situation, after all, especially if the red and blue outfit qualifies for the Champions League group stage and looks likely to defend the title, but the “what if” syndrome takes full control of Romanian young talents who dream of a (big money) move abroad as soon as the media publishes the first transfer rumors. “What if they’ll stop following / wanting me?” “What if I get injured? *knocks on wood* “What if I will never get this chance again?” Usually fueled and speculated by the agents, these questions torment only Chiriches, at this point, with Victor and Giovani Becali obeying orders received from behind bars, where their cousin, Gigi, will spend at least 3 seasons. Sorry, years. Although the quick selling of topscorer Raul Rusescu to Seville hinted that Steaua decided to cash in this summer and get the money to keep going from selling its best players, a change of strategy appears to have taken place and now Steaua gives everything to reach the group stage of the Champions League and the millions that come with this performance. The bad thing for Chiriches (and Tatarusanu, Latovlevici, Bourceanu and others…) is that there is no rush to sell and the centre-back carries a 8 million euros price tag that managed to scare away even the interested Russian clubs. Intelligent and realistic enough, he knows he’s not worth that kind of cash. And it’s not only because of him, things might have been different if he would have been a national team player of Croatia or Serbia, not Romania… The problem is he’s now trying to live up to his asking price, at least this is what I saw in his first official games of the season. Which weren’t bad, far from it, but looking close enough you could see him desperate to stand out. A ball playing centre-back, Chiriches has also been used in the past as a full back or in central midfield (hints that he does lack the physical structure for his natural role? ), but the problem is that he now looks determined to try a 3in1 role, pushing forward with the enthusiasm of an offensive fullback when he’s not stepping up from the back to dictate play from a deep position – bonuses to his defensive work in central defense. Yes, the opponents barely posed any questions to Steaua’s defense so far, but this type of approach will soon backfire. You can see him misplacing passes in dangerous positions, you can see him gone missing from the area he was supposed to defend, you can see him (this is something new) easily unsettled by an aggressive striker who dares to hassle him. He is the elegant, ball playing centre back who can run from the back, go past five players and find the top corner of the net, the kind of rare defender maybe worth the 8 million. The problem is that Chiriches is that player once every 10-15 games and, in order to make the step abroad (my bet is Steaua will never get that money), he needs to be ” just” an excellent defender, very good on the ball, who doesn’t put the team at risk, for 10-15 matches. The Brazilian ace needed just one goal to break the record established by the Albanese former international Sulejman Demollari, who had scored 36 goals in 100 matches played for Dinamo Bucharest between 1991 and 1995. Wesley scored a hattrick instead, in the 5-0 away win at CS Mioveni, doing all this in style, something he never lacked since his arrival in Romania two and a half years ago. With 1,5 million Euros paid to Leixoes, FC Vaslui was making this one of the signings that were going to confirm the club’s intentions to keep on improving, aiming for matches in Europe, as well as internal trophies. So far, they only managed to break into the Europa League group stage, stunning Lazio on “Olimpico” with a 2-2 draw in which Wesley himself got both goals. But Vaslui, who every year managed to finish in a better position than in the previous season, look now only two steps away from the league title, after a 3rd spot well deserved in the previous campaign. With Wesley flanked by Lucian Sanmartean and Adailton, behind a powerful lone striker like Mike Temwanjera, Vaslui certainly boasts the most powerful attack in Liga I and these guys have made up so far for an incredible amount of injuries that has affected the team’s defense. Games versus Lazio or Sparta Prague have shown that they can afford playing a 21 years old striker like Ionut Balaur at centre-back, yet avoid defeats, and the mentioned players also deserve praise for their approach and willingness to track back and give a hand in defense. Wesley himself, as the team’s skipper, has been an example, but he certainly is of more help this season playing as a central attacking midfielder, after almost an entire year spent as a central midfielder with playmaking duties performed from deep, in a 4-2-3-1, a role that hasn’t kept him from netting an impressive 14 goals. Still, it was a mistake the experienced coach Viorel Hizo found the strength to acknowledge and the Brazilian has now 7 goals in 9 Liga I matches, using to full service his exceptional eye for a goal, composure in front of the keeper, precise heading ability and simply amazing knowledge of attacking an empty space inside the box at just the right time. It’s all in Pantilimon’s hands now – not a bad situation for a goalkeeper, right? 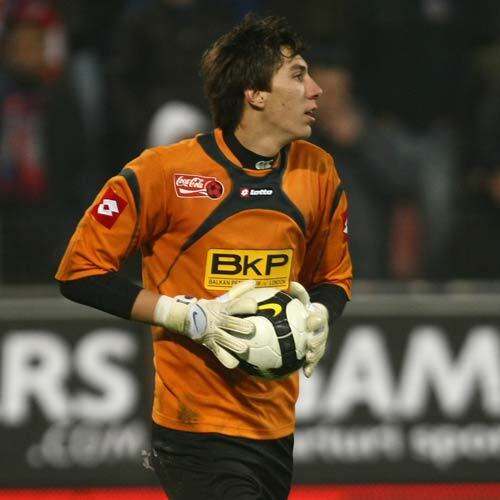 After Bogdan Stancu’s 6 million Euros move to Galatasaray in the previous winter mercato, another Romanian club is involved in a major transfer deal this summer, as Costel Pantilimon moves to Manchester City in a loan deal with an undisclosed buying clause in 2012, depending on his season with the Citizens. Ok, Stancu’s move was fishy, because he was probably worth half that sum, but we would have not moved a muscle if Pantilimon’s transfer fee/conditions were made public. It was Manchester City, the mercato champions of recent years… The surprise of an undisclosed fee was even bigger, as Politehnica Timisoara was also involved, a club that used to impress with its transparency being partially financed by the city’s local council. Put this two together and add the information that Udinese was ready to sign Pantilimon this summer in a permanent deal and you’ll get the image of a deal that would have made City’s sheik look like they’re running out of money. Or, even worse, start to look a bit cheap! Basically, it is all in the hands of the big lad who was impressing only in size at second division outfit Aerostar Bacau, six years ago. Timisoara’s current number two, Gheorghe Chivorchian, who used to run another club from Bacau, FCM, decided to “splash” 50.000 Euros, at Gheorghe Hagi’s request, but apparently made what now looks like a very costly mistake when negotiating the deal: accepted a 30% sell on clause, which might just be one of the reasons Timisoara makes the transfer to City look so complicated and mysterious. The Viola outfit probably got lot less from Manchester than what Udinese was ready to pay upfront, but certainly puts its hopes in Pantilimon’s chances to fulfill his potential at a top club. Problem is, Roberto Mancini doesn’t like to rest his number 1 and a look at the previous season shows that England’s number one played 38 games in the Premier League, but also 8 in the FA Cup and another 9 in a Europa League campaign that would have made Harry Redknapp put the gloves on himself, in an attempt to avoid fatigue and injuries to such a vital member of the squad. So, does Pantilimon really have a chance to impress and earn Timisoara more money in his one season loan with an undisclosed buying clause? I guess not, but on a personal level he should definitely benefit, training with the best and entering a regime that will do him more good than 100 more official appearances in Liga I. He still needs to improve his ability to deal with high balls, yes, at 2,02 m, Pantilimon has “a short leash” and his focus needs to be a lot better, which is something a bit different than his desire to deliver in the big games – see the excellent performances for Romania on “Parc des Princes” or for Timisoara in the European ties against Shakthar Donetsk and, no coincidence, Manchester City. He wasn’t always convincing for Timisoara in Liga I, which lead to a lost battle with Steaua’s Ciprian Tatarusanu for the number one spot in Romania’s national team in the last year, so this transfer comes at a possibly critical moment of his development. If he goes up or down from here, it’s all up to him, but I reckon the decent/hard working goalie will keep his feet on the ground, the eyes on the ball and catch this big chance, not palm it away. Gigi Becali didn’t learn a single thing from the 2009 deal that saw Cristi Tanase move from FC Arges to Steaua, in exchange of an incredible 1.8 million Euros, for just 50% of the player’s rights! Tanase has been a huge disappointment so far, in spite of glimpses of quality, like the Anfield display, when he scored against Liverpool, in the Europa League, but that doesn’t stop the Bucharest side make a second, very similar deal. Yesterday, Becali announced that in a matter of days the smaller of the Costea brothers will join Steaua in the summer. The transfer’s details: 1.4 million Euros for 60% of the player’s rights! Becali said that he initially tried to get Florin, but in spite of a 3 million Euros offer, Craiova’s owner refused to sell, as the deal would have angered the fans. In fact, this is probably a strategy to calm them down anyway, with a third hot prospect joining a Bucharest club, after the other two former U21 players, Valerica Gaman and Stefan Barboianu, now playing for Dinamo. Does Mihai Costea, who scored only 2 goals in 20 appearances this season!, deserve such an impressive investment? Definitely not. Do you expect to sell him for what? 4 million Euros? Another detail that doesn’t click: looking at the standings and knowing Universitatea’s financial struggle, there was absolutely no rush in concluding the deal now, not to mention the lack of competition for Mihai Costea’s signature! Why not wait until the summer, then, when Craiova might be below the line and with a bigger pressure to sell? A Portuguese answer to a Romanian problem: if you’re good enough, you can skip training! It’s not news anymore, but it’s another interesting story, which says a lot about the game in Romania and the struggle to behave like professionals. Rui Duarte arrived in Romania from Estrela Amadora back in 2008, when, thanks to CFR’s rise, it was not just trendy to buy players from the Portuguese market, but also the almost guaranteed way of adding quality to the roster, without spending a lot of money. It was cheaper to buy from a mid-table team playing in Liga Sagres than from a newly promoted squad in Liga I or even a second division club, the lack of common sense and realism when it comes to discussing a transfer fee being still an issue in Romanian football. 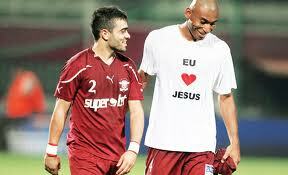 Ribeiro Moraes Junior to Metalurg Donetsk! Gloria Bistrita’s president admitted that today the two clubs agreed terms and, with the player’s father at the same table – the discussion took place just outside the pitch that hosted today one of Gloria’s friendly matches! – we can say it’s a done deal already. Metalurg will pay 1.2 million Euros, taxes included, and makes this the best ever deal done by the Romanian club, considering that, a year ago, Gloria was paying 20.000 Euros to secure the player’s services! In the meantime, the Brazilian striker produced excellent numbers, with 18 goals scored in 32 appearances, in the two halves of seasons spent in the white and blue outfit, playing for a rather mediocre team. Ribeiro Moraes Junior needed just one year to prove that he's too good for this league! A complete forward, Ribeiro Moraes Junior has a nice combination of skills, being able to score with both feet, with his head, through well-placed free-kicks. He can link-up play upfront, play as a second striker or even alone upfront. Bistrita’s number 10 looked destined for a move to Steaua this winter, especially after he signed a contract with Ioan Becali, but the Bucharest side never met Gloria’s asking price, trying to bargain and losing, in the end, a very, very good player, at least by this league’s standard. Grahovac: 9 clean sheets in 18 matches, 78,95% of the shots on goal saved! It’s that time of the year and Andrei Vochin, probably the only football journalist in Romania who writes and speaks just about football, starts providing the standings with the best players from Liga I, after the first half of season. And it’s no surprise to see up there, as the best keeper in Romania, Otelul’s Branko Grahovac, who managed to keep a clean sheet in half of the 18 games played so far. 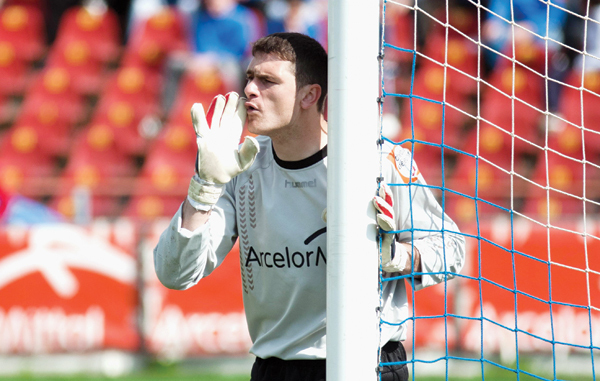 He is protecting the goal for the current league leaders and he was on the podium at the end of last season too, so the 27 years old, bought for 70.000 Euros exactly one year ago from Borac Cacak, has every right to feel good about this “award” and point the finger at the media that cannot stop praising the likes of Tatarusanu (Steaua – 6th place in the standings) and Pantilimon (Poli Timisoara – 11th! ): “This is based on stats, not sympathies, so it means I’m better than those two. I agree, Tatarusanu is Steaua’s best player, but I cannot understand how can Pantilimon be the first choice for your national team!”. Far from perfect (still prone to the odd incredible goal-causing error), Grahovac should thank not just Otelul’s defense, but the entire team, as Dorinel Munteanu asks the same involvement from every player in protecting the goal and getting the ball back. And wouldn’t look bad at all, if he’d show a little modesty, even if he came to Romania to make money, not friends.